There are the Cinque Terre Tourist Offices on all railway stations. 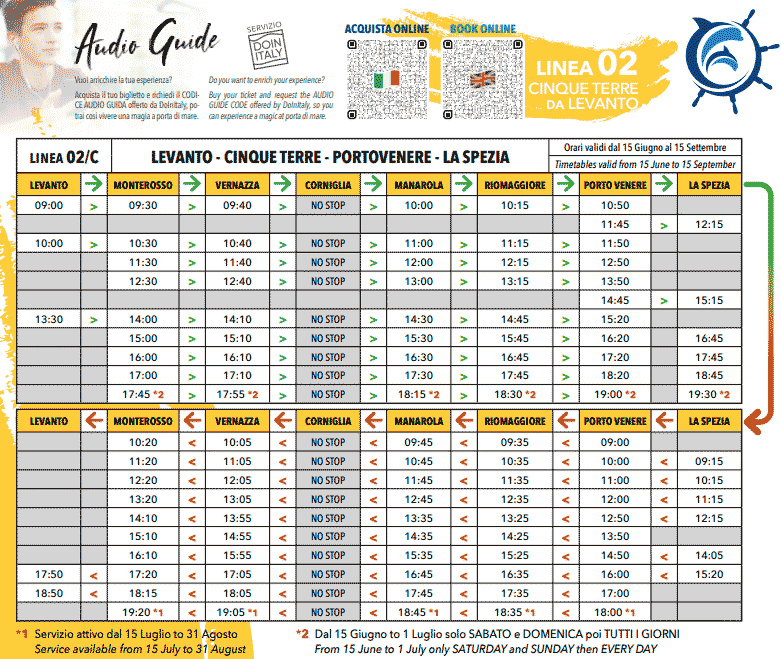 So it is possible to buy the Cinque Terre CARD and get a list of trains. Trains run about every 20-30 minutes and reach the next town through tunnels in 1-2 minutes. For further information please consult the Trenitalia web-site. Advice: for ease of movement in Cinque Terre you can buy Cinque Terre CARD that cost of 16 euro (2019). It includes trains between Levanto and La Spezia (all of Cinque Terre) for the whole day, walking trails of the Blue Path and much more. Even in the case of a transport strike 90% of trains are running. In spring and summer there are daily connections by boat from La Spezia, Portovenere, Portofino and Lerici, with last stop in Monterosso (generally from April 1st until the first week of November). The boat timetable is on the image on the left. 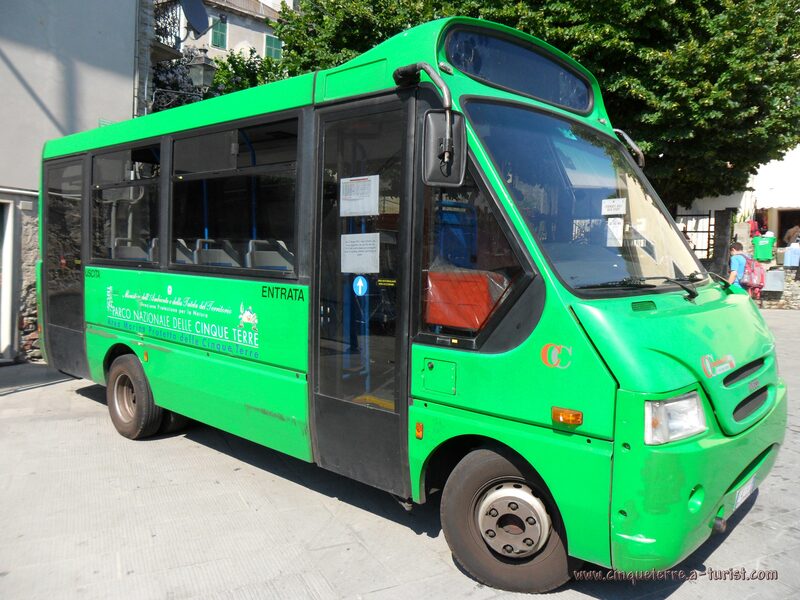 The prices range is according to the route you choose, from 6 euro to 35 euro for an unlimited one-day pass. Usage of the Bus service is included in the Cinque Terre CARD (but it doesn't cost much if you don't have the card). It may help you to save your time in each town and to get to interested places easier. Riomaggiore: offers a connection from the centre of the town up to the graveyard at the top of the village. 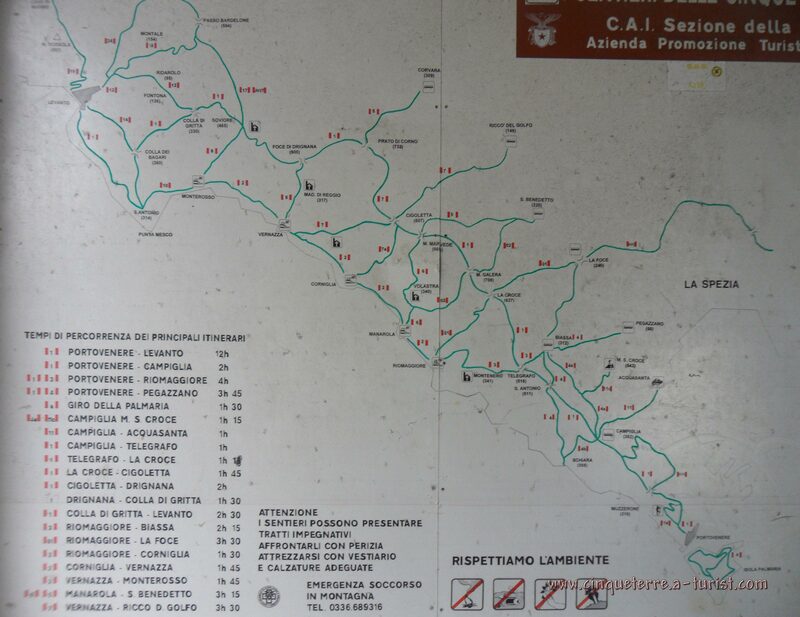 Some routes also offer a link with Colle del Telegrafo and Biassa. Manarola: offers a connection from the centre of the town to the car parking persisting to the village of Volastra. Corniglia: offers a connection from the centre of the village to the railway station. Vernazza: connect the nearby areas of the Sanctuary “Madonna Nostra Signora di Reggio” and the village of San Bernardino. Monterosso: operates inside the village as well as offering a connection to the Sanctuary "Nostra Signora di Soviore". A huge part of the Cinque Terre's success with tourists is due to the trails and walks which curve round the shore or reach the sanctuaries near each village. The view is breath-taking and enjoyable by all. 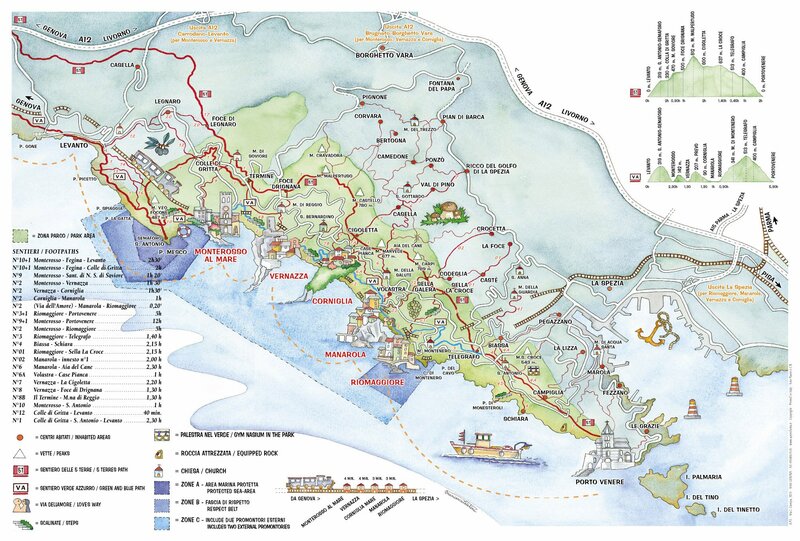 Someone can return from these hikes by bus, motor ship or train. You only need basic equipment: shoes with anti-slippery sole (if you have), long trousers to defend oneself from the thorn scrubs, some water and, according to the season, a large straw hat or a sports jacket. Here is map of the paths: official site page, landscape map, one more map. The Blue Path - connects the five villages, is the most legendary and evocative path in the Cinque Terre. Important!!! The part between Manarola and Corniglia is closed for reconstruction work (upd. April 2019). The High Path - it`s a difficult path, so if you are a serious hiker and you want a lot of fun and experience then you have to go at the High Path. This trail essentially stretches beyond the National Park of Cinque Terre and links the towns of Levanto in the north with Portovenere in the south. 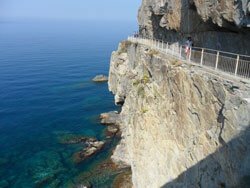 The Sanctuaries Ways - This path was created after the last war and it got its title to the fact that it links all the sanctuaries of the National Park in the Cinque Terre. Each village has its own Sanctuary to which the residents are treated by a deep devotion.